Hit by Searchcore.net Redirect Virus. Not only my homepage on Google has been changed, but i will not be able to go online properly using that browser. This is my Mom’s computer and she had Norton on there. Clearly that did not work. do you recommend a different anti virus besides Norton because clearly that did not work. Well, manual removal of Searchcore virus is recommended. Searchcore.net (aka www.searchcore.net/426) is a web site that comes in the form of the search engine and tends to provide rich online content. The World Wide Web is probably the most interesting and popular part of the Internet. Information on the Web is presented in web pages, each of which contains text, graphics, and links to other web pages. A web page resides at a website, which is nothing more than a collection of web pages. But hackers take advantage of customer’s psychology to deceive customers. So many hackers created a lot of fraudulent websites, Searchcore.net is just one of those fake domain. Similar to Searchnu Virus, Searchcore looks no difference to other real sites. Hackers cheated computer users by providing attractive information on the websites, and all look legitimate, once you clicked on that thing then you are supposed to be controlled by the browser hijacker. Then every search will be redirected to other sites on your search engine. And you can notice no anti-virus applications can pick it up. Don’t want to ruin your computer as there are lots of homework for colleague. You can combat this Adware completely with the solutions here. In order to get rid of this browser hijacker, we have tried different ways. Searchcore.net Redirect Virus may not come up as a program in Control Panel where you can uninstall programs. Manual removal is suggested here (For Advanced Users). or Contact YooSecurity Online PC Experts now for instant help. 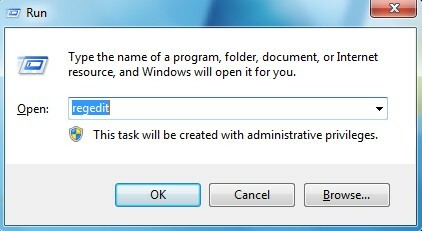 Step A: Open Windows Task Manager to end [Searchcore.net]. To do that, press Ctrl+Alt+Del keys at the same time to pull up Window Task Manager. Step B: Open Control Panel from Start menu and go to Folder Options. 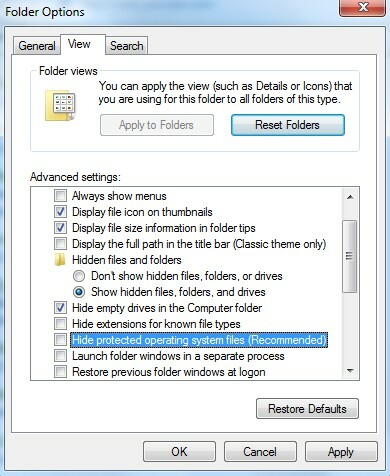 Under View tab to tick Show hidden files and folders and non-tick Hide protected operating system files (Recommended) and then click OK.
Up to now, you may be free of virus by following the tutorial above, that is very good if you were able to get rid of Searchcore.net redirect virus by yourself, but sometimes the virus is really stubborn beyond you could image. It keeps coming back even if you trashed it away from your computer many times, what is worse, you encountered other problems, such as your browser messed up, and your computer froze down. In other words, you might do something incorrectly then created new problems. Anyway, even if it’s called a browser hijacker which usually aims at browsers, it can extend its infection to other computer functions. To quickly solved your nasty virus problem, please chat with PC experts online right way. You’ll be protected against most malicious software (malware) that might come your way. Notice: Files and registry entries associated with this Searchcore.net redirect virus can be changeable. You may not be able to find some of the above files to delete. And if you are not sure for Searchcore removal, please do not rush to delete any of the uncertain files. For future suggestions and assistance, contact YooSecurity Online PC Experts now.